Charge your Macbook laptops and phones on the go. Exclusive to Lizone, Extra Pro Series amp-adjustment technology intelligently identifies your device to deliver its fastest possible charge. Charger your MacBook Pro 13-inch approach 2.5 times, MacBook Pro 15-inch 2.0 times, MacBook Pro 17-inch 1.5 times; MacBook Air 11-inch 4 times and New MacBook 12-inch 5 times(included USB to Type-C Calbe); iPad Mini 1 approach 7.0 times; iPhone 20 times and Samsung Galaxy S6 15 times. Lizone Technology enables full speed laptop DC port (up to 4.5A) and USB port (up to 2.1A), 4-5 Hours full Charge for the Extra Pro 50000mAh External Battery. This thing is remarkably standard. About the same size as a laptop portable external battery, you simply will not find a more portable powerpack. At Lizone, we believe in our products. That's why we back them all with an 18-month warranty and provide friendly, easy-to-reach support. -Use your original USB cable or a third-party certified one (such as MFi). -Compatible with Apple MacBook Pro Air (All); Apple and Android smartphones(All), tablets (including the Nexus 7) and other USB-charged devices except for the iPod, HP TouchPad, Dell Venue 11 Pro, Asus tablets and GPS Bluetooth devices. Exclusive Lizone QC Technology: Detects your device to deliver its fastest possible charge speed up to 6.6 amps (with DC and USB Port for laptops or Smartphones). Highest efficiency energy efficiency rate 10% above the previous generation. High Capacity: Charge MacBook Pro 13-inch approach 2.5 times, MacBook Pro 15-inch 2.0 times, MacBook Pro 17-inch 1.5 times; MacBook Air 11-inch approach 4 times, MacBook Air 13-inch 3 times and New MacBook 12-inch 5 times(included USB Type C Calbe); iPad Mini 1 approach 7.0 times; iPhone approach 20 times and Samsung Galaxy S6 approach 15 times. Incredibly Compact: Standard Size (9 × 4.6 × 0.8 inch, 25oz ) it fits perfectly in your pocket. High Speed Recharges in Around 3.5?4.5 hours with a 4.5A Max 90W Lizone Ultra Slim USB AC Adapter, and it can replace any MacBook Magsafe or Magsafe 2 original Ac adapter. The Lizone Advantage: Join the 5 million+ powered by our leading technology. Compatible with Apple MacBook, MacBook Pro, MacBook Air?All Versions) New MacBook 12-inch; Apple and Android smartphones?All Versions), tablets (including the Nexus 7) and other USB-charged devices except for the iPod nano, iPod Classic, HP TouchPad, Dell Venue 11 Pro, Asus tablets and some GPS and Bluetooth devices. 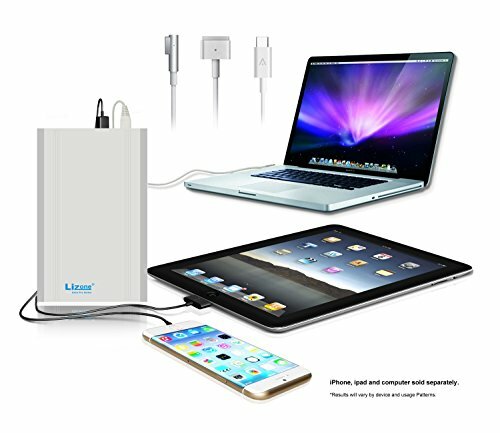 Package Contents : Lizone Extra Pro 50000mAh Portable Charger External Battery Power Bank, Extra Pro Slim 90W AC Adapter with USB, Magsafe L Tip Charge Cable, Magsafe 2 T Tip Charge Cable, USB Type-C Cable, Extra Pro Battery Charger Cable, AC Power cord, Instruction Manual, our fan-favorite 18-month warranty and friendly customer service. If you have any questions about this product by Lizone, contact us by completing and submitting the form below. If you are looking for a specif part number, please include it with your message.